Chickens recognise human beauty, starlings can be pessimistic and elephants grieve for their fallen comrades: these are the perhaps surprising claims of Dr Jonathan Balcombe, an independent animal behaviour research scientist. In a new book, he argues that a flood of studies of species ranging from minnows to monkeys adds up to a revolution in our understanding of the way other animals experience the world. For Balcombe, who was born in the UK and now lives on the east coast of the States, this new understanding leads to radical conclusions. So the idea that chickens have an aesthetic sense, for instance… we should pay attention to this because it seems to have profound implications for the way in which we treat animals. For much of the 20th century, it was taboo to ask questions about what animals think and what they feel. That’s changed; now we have a spate of studies of phenomena that show that animals are, in all the important ways, sentient in the manner that we are. They may not lead the same sorts of lives that we have, but they feel pleasure and pain just as intensely. They have just as acute emotional experiences as we do – there are studies showing that there are real inner lives to these animals. What does this say about our relationship to animals? The paradox is that as our knowledge of animals increases, our treatment of them falls further behind because we still live according to a might-makes-right strategy, which is the kind of thinking that justified colonialism and slavery. Unfortunately, our treatment of animals remains pretty much medieval. Could you clarify this point about sentience? Sentience is the capacity for feeling things, usually pleasures and pains – but it’s a very broad concept, ranging from grief to optimism, from positive to negative feelings. The key is that it’s the bedrock of ethics: humans are moral beings, what the philosophers would call moral agents, who are able to make moral decisions, and sentience is what makes those moral systems. It’s what makes a human life important – it’s what makes murder, ultimately, a terrible crime. It’s because you’ve deprived the individual of a future life. Given that animals are acutely sentient in the important ways – I’m not talking about building computers or reading books – we need to expand our moral circle to include them. In a study titled “Chickens prefer beautiful humans”, human faces were photographed and digitised, so they could be presented to undergraduates, who then rated them according to attractiveness. The male faces were rated by female students and vice versa. They came up with a gradation of the most and least attractive. Then chickens were presented with the same faces and strikingly, the chickens’ preferences in binary choices, for whatever reason, showed a 98 per cent overlap with the humans’ ratings. 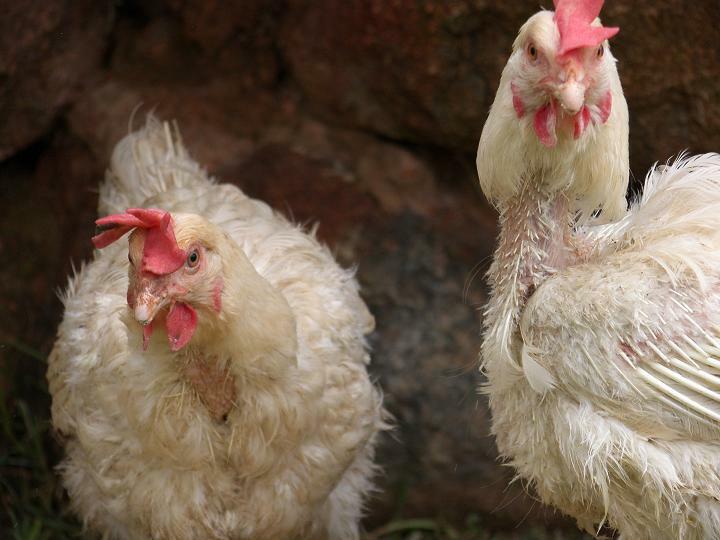 It doesn’t necessarily mean that the chickens found those faces more attractive – though that’s what the authors seem to suggest. What meaning that has in a chicken’s world I don’t know. But what it does say to me is that they’re very perceptive about cues and those perceptions are very similar to ours in terms of aesthetics. 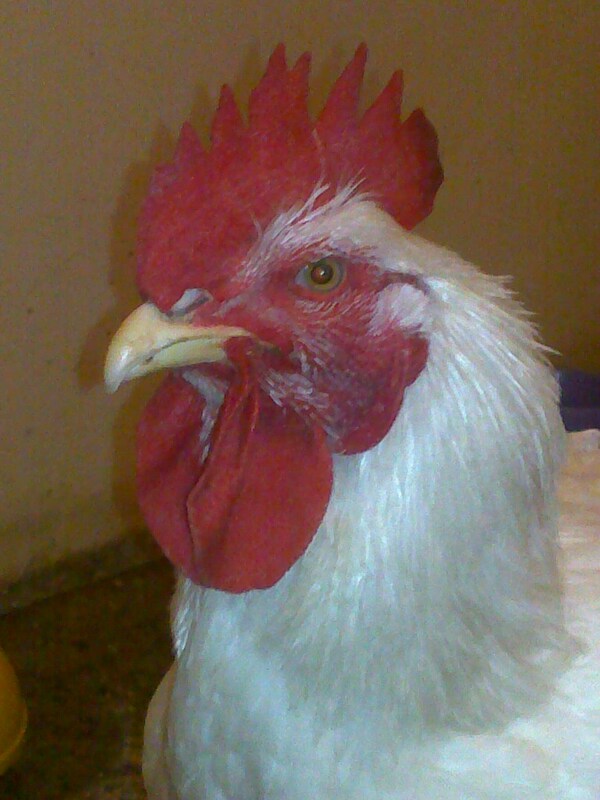 In your book you write: “Why should chickens find us beautiful at all? Today in the US we kill and cause suffering to more chickens than there are human beings on the entire planet.” Surely there’s a danger of taking individual studies and over-interpreting them, reading too much into them. This particular study had six chickens in it: to go from the preferences they exhibited to an idea about beauty, isn’t that a bit of a leap? In the time it took you to ask that question, about 3,500 chickens were slaughtered in the US, so that gives an idea of the scale of the killing of these particular animals. Some biologists would call them the most successful animals on earth because there are so many of them now, but I would call them the least successful because the vast majority lead such short, miserable lives. If you look at it from a population outcome, it’s a very different outcome than if you look at it as individuals, but it’s individuals who are sentient. But just because chickens rate humans in the same way as humans do in this particular study that doesn’t mean their sentience is the same as ours, and I certainly wouldn’t claim that. Although I wouldn’t necessarily claim that they’re less sensitive to the pain of a broken wing than we are to the pain of a broken arm: that can be debated. That is accessible to science. 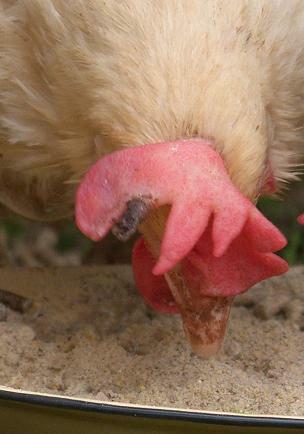 But what the study does say – and this is just one study of many – is that chickens have lives that matter. And this gets to the heart of some of the cognitive and emotional studies that I’m trying to bring to light: animals don’t merely live in the moment. They have lives, moods and dispositions. They really have a welfare in the richest sense of the term. That means we have to look hard and reconsider the current relationship we have with them. People tend to see faces in clouds or hear voices in draughty buildings; we’re very good at anthropomorphising our surroundings. Whether what we now believe that animals experience is really the same thing as human emotions is a very open question, isn’t it? Here’s an example of an emotional study that’s based on rigorous science. It’s a study of the chacma baboon. These particular populations have been studied in Botswana for 30 years by the same scientists, so you have long-term observational and experimental studies with animals in their own milieu. It’s known that for women who lose an infant, it’s a terrible, traumatic, sad event. It’s known that they grieve, naturally, and that grief is reflected physiologically by an increase of glucocorticoid hormones in their blood for a month or more. These baboons show a similar pattern of behaviour; if a baboon mother in the Okavango Delta in Botswana loses her baby, the scientists are able to measure the hormone levels in her blood in a very non-invasive way. They don’t have to take a blood sample, they simply keep an eye out and when the female defecates they shout: “Oh, Lucy just shat, go get that!” and they analyse the faeces. This shows that their glucocorticoid levels also go up for about a month. And the levels of their closest associates, of the female baboons which they relate to and have friendships with, also go up: there’s an osmotic effect. Again in parallel with humans; humans rally round, support each other, increase our social networks. Baboons show a similar pattern. Females who have lost an infant will groom more during that month and receive more grooming. It’s thought to be a form of therapy to help overcome the grief that presumably they’re experiencing. This is the challenge with emotions: they’re private feelings – and that’s why science did neglect these questions for a long time. There are all sorts of nasty things that go on with predators catching prey, male lions killing the young when they join a new pride. Do animals have any kind of moral responsibility? Absolutely. One of the frontiers of science is this study of virtue in animals: increasingly it’s coming to light that animals have a moral awareness, or a moral consideration about how they behave. This is particularly the case with social animals, who’ve evolved to live in groups. Living in groups is full of compromise, you give and take and you want to sustain good relationships with others or you may be an outcast, and that’s not in your self-interest – so one can make genetic arguments for the evolution of virtue and moral behaviour – certainly we manifest it in many ways. Do plants have an intrinsic value? Albert Schweitzer advocated an idea of “reverence for life”. He coined that phrase in 1915 and I love it. It speaks to plants because plants are also living organisms. We could quibble about whether or not they’re sentient, although most scientists would say they’re not. But even if they aren’t sentient, we should respect them and that relates to the broader issues of our relationship to animals. People often ask me as a vegetarian – a vegan in fact – “What about plants? If you’re a vegetarian, you’re consuming plants!” But if you’re a meat-eater you’re indirectly consuming many more plants, because you’re higher on the food chain and cows have to eat plants to make muscle. Being a vegetarian is a more plant-friendly way of life anyway. I believe in respecting all life – I don’t want to see trees uprooted any more than I want to see cows slaughtered, but there is a moral difference because cows are sentient and a plant is not. The hens have now discovered the most dismal, concrete part of our garden. 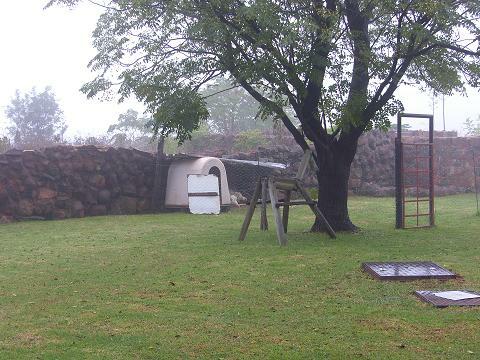 The washing line area. Despite various tempting propositions they keep going back to the concrete spot instead of the grass. How strange? The good news is that they are walking right up to us now. 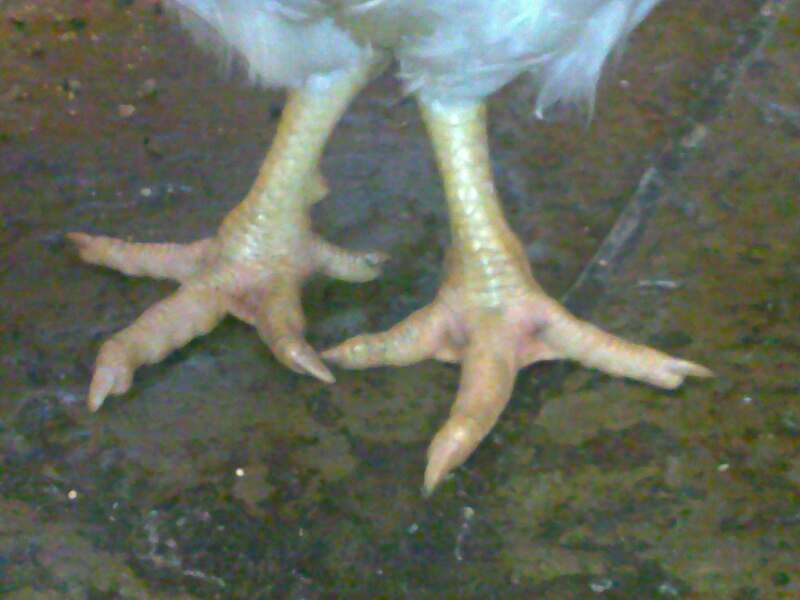 I keep expecting a peck on someone’s big toe, but none so far. He he. Guess the poop comes with the territory …. And boy, do they poop A LOT! I’m working at the office today so I have no major updates. They have made it through the night – with Goldie’s bottom firmly placed in the food bowl instead of the comfy hay. Clearly these girls are the low maintenance, no fuss type J. I’ll let you know how things are going when I’m home in the afternoon. Bum in the food bowl? Again, I both apologise, and recluse myself from any responsibility for these chickens behaviour. I can offer no guarantee on good manners. Indeed – I seem to have missed the fine print on the lack of good manners. I’ve suffered my first few pecks from the feisty Goldie…. Have myself convinced that they were just warnings and not intended to draw blood. 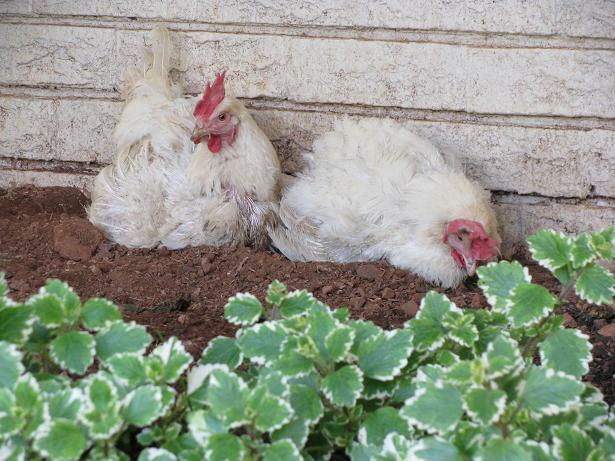 Today they have had their first dust bath – and boy did they enjoy it like a spent mother at the Saxon dol. They dug little beds for themselves in the sand and fluffed their feathers up. I’m no chicken guru but I believe they were looking quite pleased with life. Their house arrived today. They did not seem that impressed gunning instead for our back door. But that is where they are sleeping tonight. Well, Goldie and Chick-Chick (dodgy cone) are doing just fine this morning. They woke up and launched into their mash with great gusto. Goldie seems to have taken the role of head honcho – making Chick-Chick wait for her turn to feed and enforcing her leadership role with the occasional peck. 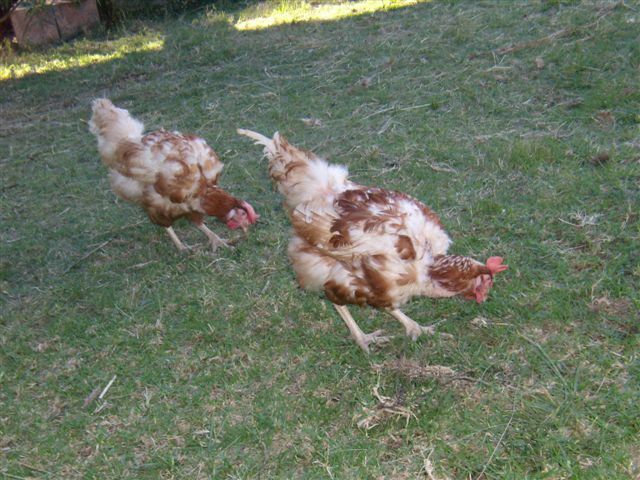 They are quite chatty and respond to our talking with soft clucks. I let them out into the front garden this morning. They wasted no time in exploring their new surrounds and pecking away at the grass and mud. With Goldie distracted by the garden, Chick-Chick grabbed the opportunity to head for the food and water. Then Goldie suddenly disappeared. At first we thought she’d slipped into the house unnoticed, then we thought she might’ve sneaked into the tall bushes. Eventually, she popped her head around the side of the house and gave us a little cluck. She’d found the route to the back garden. I left her to do her own exploring and later found her at the very bottom of the back garden merrily meandering through the plants and paths. Pretty soon, Chick-Chick found her way around the back too. Looks like they’ve cast their vote on where they’d like to roam. I didn’t take note of the state of Goldie’s cone when we brought her home, but it is standing almost bolt upright today …. Well, bar the one little piece at the back that is still drooping. Chick-chick’s cone is still very droopy though. They’re quite approachable – they have even walked curiously closer to me when I am standing close by. I’ll get some pictures to you as soon as I have a chance. 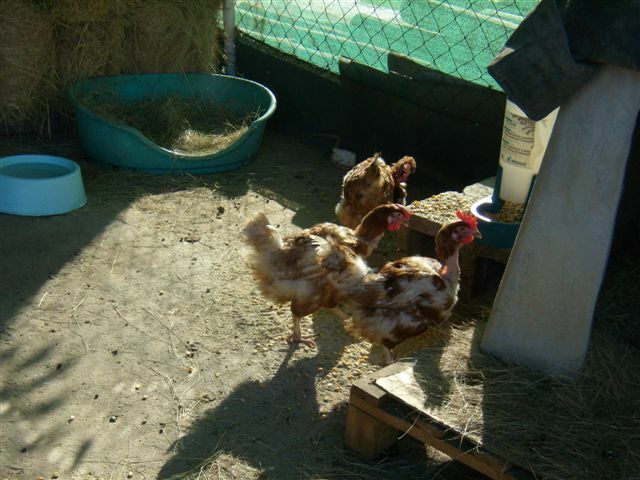 Went to open the chicken hoek this morning and check the new girls. All made it through the night. This is on my mind each morning for the first few days after a chicken rescue. Each night that they make it through, sees them stand a better chance of survival. They left the safety of their ‘cave’ and entered the outside world with less trepidation this morning than yesterday morning. They are already growing in confidence. I am satisfied that they are all now eating and drinking on their own. One chicken has what looks remarkably like a burn on her comb. A portion of her comb is black, hard and crusty, almost charred. Despite looking painful, and not what it should be, she seems to be energetic, and it is not infected. Will keep an eye on it. I wonder what happened? The day is relatively uneventful. 2 eggs from new chicks. Late in the avie, when I go to put them to bed, one of the girls surprises me by running to meet me at the gate, and allows me to stroke her, and pick her up. The other three stay clear of me, but I am really touched by this display of affection and trust, after all she has been through at the hands of humans. All 4 chickens rushed out to greet the day with confidence this morning. 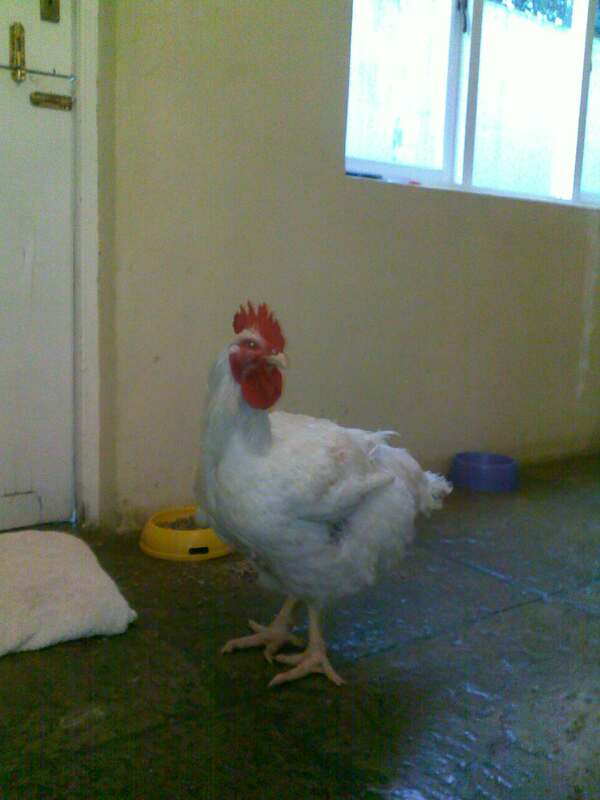 The weather is not great for chickens. They are all cold and wet and miserable. Today I take them back to Parkhurst to be fetched by their respective new families. I shall miss them. The girls did well today. Jaqui and her gorgeous family fetched two of the chicks late afternoon. Celeste will fetch over the weekend. 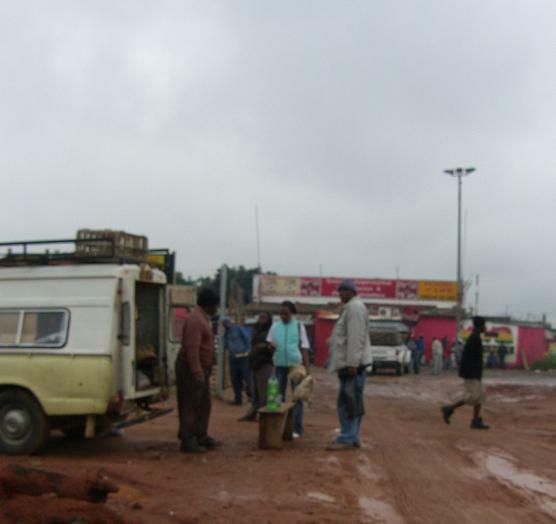 Stopped at Zandspruit. Usual chicken seller was there. Very happy to see that chickens had water this time, and he was proud to show me. We have had numerous arguments about him not supplying water to chicks. It seems something has changed through our conversations. 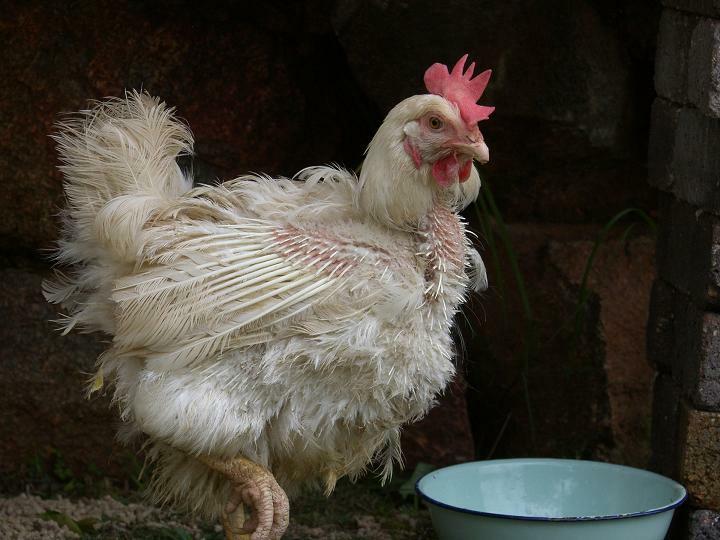 Got our 4 chickens who were dirty, smelly and very frightened –they reminded me of a phrase coined by Patricia Glyn, ‘diarrhoea smudged bodies’. 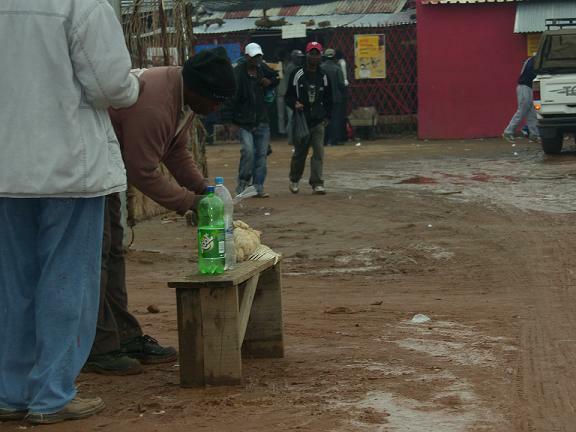 I stayed in my car at Zandspruit and observed people coming to buy their weekends meat. I focused on the 4 chickens I did have in my care now, and tried to detach from the 4 I saw bound and carried away, held roughly by their wings, desperately squawking. Their backyard slaughter waiting for them. Capturing these images through the lens of my camera helps me detach. Binding Chickens legs for ease of carrying away for backyard slaughter. Chickens get carried by their wings. 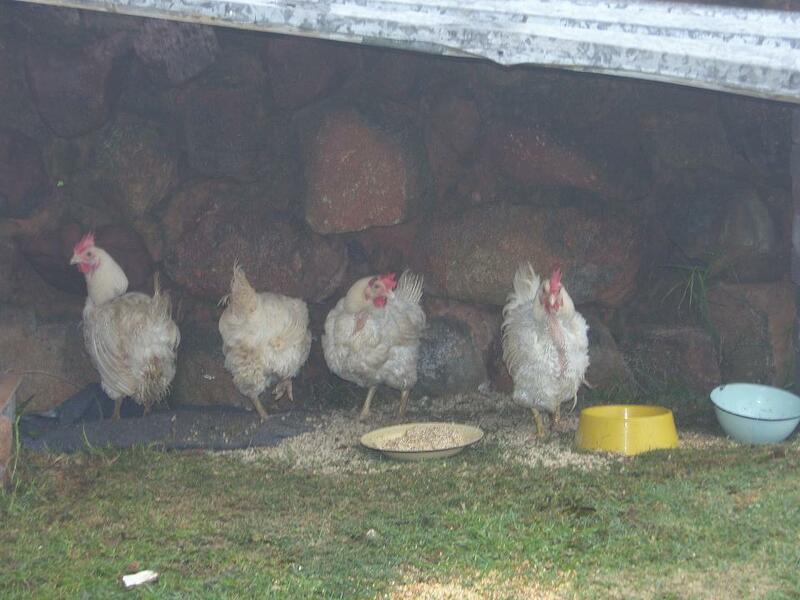 When I get the girls to Magaliesburg, we release them into our temporary chicken hoek, were they will spend the next few days, getting used to the world around them. De stressing, eating, sleeping, drinking and recovering. On opening the box, we discover one of these terrified hens has managed to lay an egg. I feel as though she has scored one against the world already – what an injustice if she had laid it an hour before, this great gift her body has to offer, and had been slaughtered later that night. The girls eat little and do not recognise the water I am giving them. Before bed time, my husband Nick, and I make a call to bring them into the kitchen and crop feed them (an invasive process of passing a tube down the throat into the crop – a storage facility for food – and putting food down the tube via syringe). I feed them a watery solution of pronutro and warm water. Their crops are hardly bulging, but I feel they have had some food and hydration to give them a chance of good sleep. The thought of going to bed on an empty tummy, does not fly with me! We put them to bed. Although they have a dog kennel filled with straw, I cover the straw with a large fluffy blanket. These girls are weak, and it is a particularly cold and wet night. They are worn down by this stage and make little attempt to fight with us. Yay, all 4 girls alive. They have made it through their first night. Two, start eating during the morning on their own. The other 2 get it by lunchtime. I am aware that they are not drinking. Often the battery hens do not recognise water in the new and different bowl and setting you are offering it to them in. If one takes the bold step of trying, I know the rest will follow. My friend Kathy and I observe the hens. They are still not drinking. I identify the bravest hen. She allows me to come within half a metre of her. I wiggle my finger in the bowl, and make little splashes. She watches with interest, I move away from the bowl, and she slowly moves towards it. Bingo, she drinks! We quietly clap with excitement. The other two hens are drinking within half an hour. By evening the last hen is also drinking. Again, feel so safe that these hens will have an amazing life. Obligatory nail clip in the afternoon. Their nails are long from not being able to walk around and scratch in the dirt. They are walking easier post pedicure. See comments posted for this post by Celeste, mom to other two rescues from weekend. Another amazing chicken lover! Yes, this is our beautiful Bella at 24 weeks! Bella has finally revealed her true identity with a morning crow, and some particularly testosterone aggro behaviour. I began to suspect Bella may be a rooster a week or two ago when Bella began to attack my hand when I put down food for her (him). I also witnessed a vicious attack on a piece of toilet paper. Bella ripped the offending tissue into a number of different pieces and stomped all over them, with lightning speed. One assumes a ‘chicken expert’ would have the basics of sexing a chicken under wraps, hence my reticence to go public with this piece of information. I stayed in denial. However, there really is no hiding this fact any longer, and so with great pride I reveal Bello our beautiful 6 kg rooster to the world via blog. Do, Re and Me. Rescued by Chicken rehab and Rescue at the request of Fiona, who got in contact with us through the article in Jan Animal Voice. Here are three gals in their new home. The girls are doing well, the weather is so miserable as soon as its a bit brighter I will take some nicer pics of them so you can see them enjoying themselves. They are as ever stuck to each other like glue and are a pleasure to have a round and watch them just enjoy the simple things we all take for granted.